Revenue Method B is the most widely used revenue method in Deltek Vision. In fairness, this is Vision’s default method for projects whose charge type is Regular. As a result, most firms use it since it’s easy to deploy and seems to work, or so we think. Revenue Method B works well when we have a time & materials project that is billed frequently. In this scenario, we have a perfect match between revenue and costs and can easily measure project performance. On the other hand, when billings and costs don’t align, measuring interim project performance becomes more challenging. Milestone billings or fixed fee projects are billed on cycles that don’t always coincide with a proper revenue accrual or as the associated costs are incurred on the project. Keep in mind that we are not matching revenues and expenses, and this can lead to unreliable financial results during the project life cycle. In month one, the project has no income (no billings) and incurs costs of $3,000. With Revenue Method B, the project incurs a $3,000 gross margin loss. In month two, when the project is billed, we have the reverse situation; $10,000 Revenue and no cost, which results in a $10,000 Gross Margin profit. So…did we make money or not? From month to month, it is very difficult to assess the true profitability of the project. Therefore, we must wait until a point where billings and costs align or the project is closed. In this simple example, we can look at the end of month 2 and determine our performance. However, what if this project spans over a year or more? 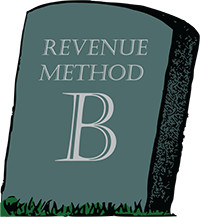 With Revenue Method B, we may never have a point where revenue and costs align to make an informed decision on profitability. To accurately measure performance, a proper matching of revenue and costs is mandatory. Revenue must be earned as work is completed or as the associated costs are incurred. This is the best accounting practice, and with the impending requirement of FASB 606, will now be part of Generally Accepted Accounting Principles (GAAP). Clearly, Revenue Method B will not work well when the earnings process does not align with the billing process. For those of us using this method, we are reporting inaccurate results to our stakeholders or making manual adjustments to accommodate for Revenue Method B’s shortcomings. Fortunately, Deltek Vision offers alternatives that will help us properly record revenue and comply with FASB 606. In May 2014, FASB 606 was released and will be required by December 2018. FASB 606 will render Revenue Method B obsolete for most projects. FASB 606 does not reference billings unless billings specifically follow the earnings process described above. Therefore, to be in compliance with this new requirement, we must abandon Revenue Method B for most of our projects. Stay tuned for the next chapter…User Defined Revenue Methods. We will look at how we can use Deltek Vision to create Revenue Methods that will comply with FASB 606. In the meantime, click here to learn more about FASB 606.